Getting up at six o’clock on a Saturday may seem crazy, but this was worth it. 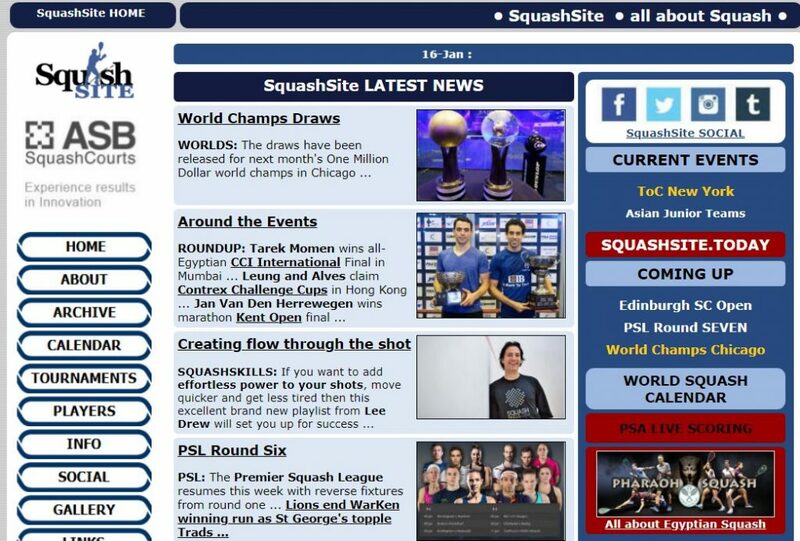 Switzerland is a small country in many aspects, squash included. It’s very much a fringe sport here like in other countries. Over the years, squash has progressed and declined in waves. However, these days there are a few bigger events, one of which is the Grasshopper Cup. During the Grasshopper Cup exhibition, matches of four top players were organised. 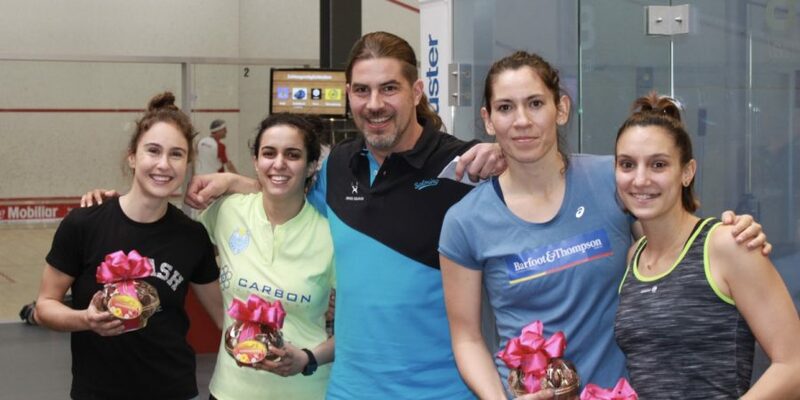 This exhibition was an all ladies event, consisting of Nele Gilis (PSA 29), Joelle King (PSA 5), Camille Serme (PSA 4) and Nour El Tayeb (PSA 3). 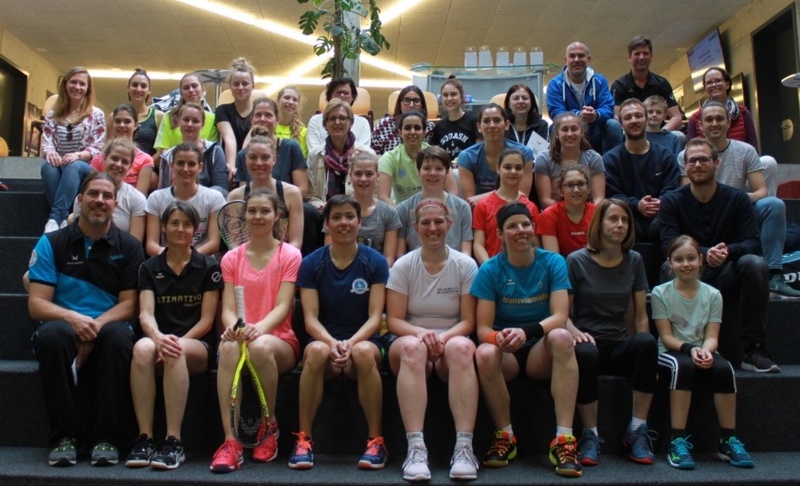 In the wake of those exhibition matches, Swiss Squash organised a women’s event in Uster, a town right outside of Zurich. Amateur, advanced, and even professional players could sign up for free and play with all four of the exhibition players, totalling in twenty-eight female players getting to enjoy games with the elites. Additionally, coaches and interested players could take part in discussions with the four players. Coming from a small local club, I teach juniors. Five of the sixteen kids I coach are girls. This is a very skewed ratio for what you would usually get. In most clubs the boys far outnumber the girls in their junior section. After getting the invitation to participate in those talks, I promptly accepted, hoping to get input about how to coach my juniors. Arriving at the venue a little early, I got to witness the setup of the free food and drink, the lightening up of the courts and everyone arriving. It’s not a common sight for me to see more women at a squash event than men, but this was a memorable experience. I would like to say that this event totally changed my view on women’s squash and what a huge revelation this was for me. However, I have lost more than enough matches against women, seen too many professional matches and witnessed too many drills in which the girls beat the boys, to ever have thought women’s squash is somehow inferior to the men’s game. The structure of the talks was organised so that we would get to talk to one of the pros for a half an hour each, beginning with Joelle King, continuing with Nour El Tayeb, then Camille Serme and finishing with Nele Gilis. Questions ranging from their training regimes, to their personal lives were all discussed and broken down to the nitty-gritty details. After a few slightly timid questions to King, the audience became more lively and started firing more questions at her, giving her the chance to answer inquiries about her coaches and changes to the staff. 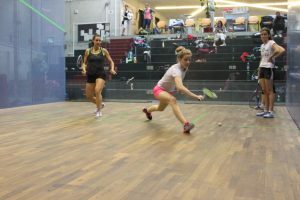 As New Zealand is a squash nation that traditionally focused on physical fitness rather than tactics and gameplay, King experienced major changes in her game when she switched to Hadrian Stiff about a year ago. 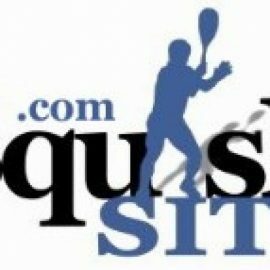 Hadrian Stiff is currently the coach of many top players, like Mohammed Elshorbagy, his brother and many other top players. King praised the way Stiff takes an individual approach to every player he coaches. This meant for King that she didn’t even pick up a racket in the first training session with Stiff, simply doing exercises including rhythm and music. “God I looked weird!” Joelle exclaimed, remembering that session. Moving to her junior years and the transition to going pro, King emphasized the importance of her mother, always giving her the opportunity to visit big tournaments in distant countries to expose her to tougher competition and to show her that there was always room for improvement. New Zealand only had so many good players and eventually King decided to leave the country to find opponents better suited to advance her skills. Back home they would also compete with the boys just to get practice. The topic of many girls dropping out of the sport around the age of adolescence came up, with King explaining that this was probably because boys and girls are different, girls going through a difficult phase in their life and also funding being a difficulty. King concluded that there’s a quite a difference between training girls and boys. 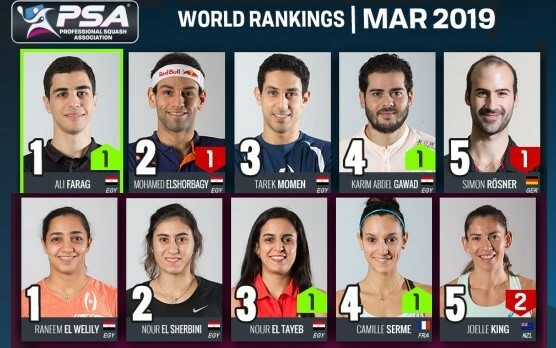 In contrast, Nour El Tayeb always had lots of competition back home. Female juniors in Egypt play the boys and grown-ups very early on and keep that competitive spirit after going pro. Also, the girls in Egypt had a vast group of very talented and ambitious players, meaning they would never lack any competition. For El Tayeb the game seems to come a lot more natural. She doesn’t do a lot of mental training, except for visualisation that is. On the coaching side, she’s had the same coach, Haitham Effat, for a long time, but added a fitness coach and another one for squash, in order to get different inputs. Naturally, the topic of her being married to the world champion and first in the standings Ali Farag had to be addressed. Being able to reflect on her own games with someone she feels comfortable with and at the same time has such a vast knowledge of the game makes for the ultimate combination. That wasn’t always easy El Tayeb said: “I had to make him tell me what I had to hear, not what I wanted to hear.” The audience chuckled. The talk with Camille Serme, the French number one, started off by discussing her coach Philippe Signoret, whom she’s had since the age of seven. Her team has expanded, adding a fitness and a mental coach. According to Serme, everyone should have a mental coach to help them with all aspects of the game. Similar to Nour El Tayeb, Serme went to finish school before going fully professional and she even studied journalism, while competing on the tour later on. For Serme the communication part between her and the coach is key. Usually, the coach would have to give more input in the junior years, while in later years she would get increasingly more vocal about her needs and so her coach could adapt to her. Like the others, Nele Gilis has had an important coach early on. Ronny Vlassaks was there for her since the age of ten and helped her get to a very respectable ranking. Recently, however, Gilis has switched to a new coach, Natalie Grinham. The former world number two gives Gilis a deeper insight into the world of squash and tactics. Of course, the coaches weren’t the only influence in Gilis’ career. Her mother had gotten her into squash early on, taking her to tournaments and putting up with the costs that come along with that kind of commitment. From an early age she wanted to go pro and aspire to the likes of Nicol David. The transition to professional squash, however, is not easy. This is a thread that weaves through most of the talks. The first few years on tour, the players generally struggle with mastering the game until the big wins start coming. King claimed to not have won a match in her first year and Serme had a tough two years starting out. Most important to me was the coaching aspect though. The relation between the coach and the female junior isn’t an easy one to handle. Although there was a general consensus on the opinion that every player has specific needs and therefore requires an individual approach to their training, there was also consensus that it’s not easy at first to have a male coach compared to a female coach. Only two of the players had female coaches in their career and only one has an active female coach at present. This shows for a lack of professional female coaches. There simply aren’t many around apparently. The lack of female coaches could change in the generations to come, as there are now more women playing at a high level, who have the potential to become professional coaches in the future. As a key point, all of the players named one thing that is imperative to the whole coach-player relationship: trust. Gaining your junior’s trust is important in order to have an impact on their game. Even if it’s a bigger obstacle for a male coach to gain the trust of a female junior, it’s essential to gain your junior’s trust and to be able to understand them and thereby be able to help them on their way. My take-home messages of the day were: firstly, that the individuality of each player counts more than trying to implement your own style on them as a coach; secondly, that women’s squash is on a good path to gaining more and more recognition; and lastly, that trust is essential in order to teach a junior and must be won before any significant training can be commenced. When I go to a squash club, not playing always feels like a bit of a waste. Today it wasn’t though. 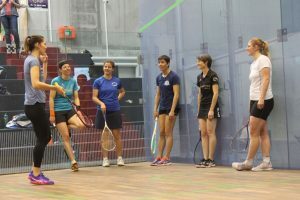 The advice I took onboard for my own coaching, seeing all these women enjoying squash with the pros and getting to know these four fantastic ladies has been a very enjoyable experience. I look forward to the future of the Grasshopper Cup, when it hopefully will not only have an exhibition, but maybe even its own big event for female players to compete in.